Мы представляем британскую компанию, которая уверенно стремится занять лидирующие позиции в области международных инвестиций и управления качеством финансовых активов. Опытная команда профессиональных трейдеров на мультивалютной рынке Форекс и на Лондонской фондовой бирже готов предоставить высокодоходным и безопасное обслуживание всем желающим. Мы предлагаем лучшие условия для краткосрочного инвестирования, который приносит вам ежедневную прибыль. Сотрудничество с ведущими специалистами класса финансовых рынков является ключом к успеху вашего заработка. 04.27.16 22:33	Account	Transfer	-200.00	Sent Payment: 200.00 USD to account U11442845 from U4731311. Batch: 130534408. Memo: Shopping Cart Payment. 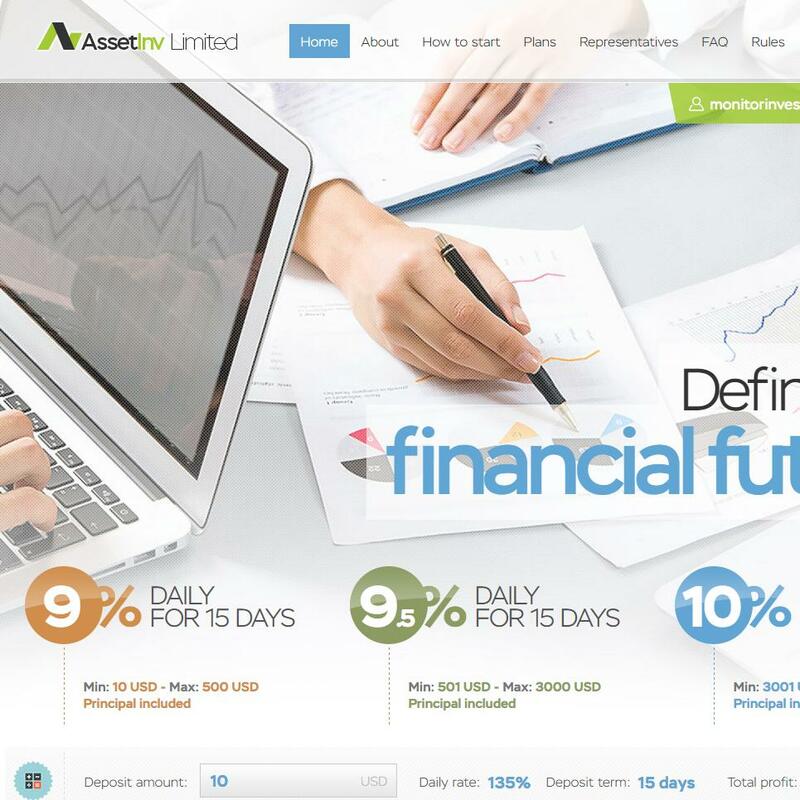 Deposit to Asset-Inv.com User monitorinvestnet. 04.28.16 19:01	Account	Receive	+5.00	Received Payment 5.00 USD from account U11442845 to account U4731311. Batch: 130673000. Memo: API Payment. Withdraw to monitorinvestnet from Asset-Inv.com. 04.29.16 11:14	Account	Receive	+24.85	Received Payment 24.85 USD from account U11442845 to account U4731311. Batch: 130762608. Memo: API Payment. Withdraw to monitorinvestnet from Asset-Inv.com. 04.30.16 12:54 Account Receive	+2.2 Received Payment 2.2 USD from account U11442845 to account U4731311. Batch: 130918120. Memo: API Payment. Withdraw to monitorinvestnet from Asset-Inv.com. 04.30.16 09:01 Account Receive	+18.5 Received Payment 18.5 USD from account U11442845 to account U4731311. Batch: 130892287. Memo: API Payment. Withdraw to monitorinvestnet from Asset-Inv.com. 05.01.16 10:32	Account	Receive	+18.00	Received Payment 18.00 USD from account U11442845 to account U4731311. Batch: 131080220. Memo: API Payment. Withdraw to monitorinvestnet from Asset-Inv.com. 05.02.16 17:11	Account	Receive	+4.75	Received Payment 4.75 USD from account U11442845 to account U4731311. Batch: 131419178. Memo: API Payment. Withdraw to monitorinvestnet from Asset-Inv.com. 05.02.16 12:23	Account	Receive	+25.00	Received Payment 25.00 USD from account U11442845 to account U4731311. Batch: 131383514. Memo: API Payment. Withdraw to monitorinvestnet from Asset-Inv.com. 30.04.16 15:37;Account;Receive;Received Payment 2.5 USD from account U11442845 to account U1294989. Batch: 130935746. Memo: API Payment. Withdraw to allhyips from Asset-Inv.com. 30.04.16 09:07;Account;Receive;Received Payment 19.5 USD from account U11442845 to account U1294989. Batch: 130892951. Memo: API Payment. Withdraw to allhyips from Asset-Inv.com. 29.04.16 21:59;Account;Receive;Received Payment 3.00 USD from account U11442845 to account U1294989. Batch: 130849924. Memo: API Payment. Withdraw to allhyips from Asset-Inv.com. 29.04.16 10:25;Account;Receive;Received Payment 18.5 USD from account U11442845 to account U1294989. Batch: 130756118. Memo: API Payment. Withdraw to allhyips from Asset-Inv.com. 28.04.16 21:48;Account;Receive;Received Payment 14.75 USD from account U11442845 to account U1294989. Batch: 130694415. Memo: API Payment. Withdraw to allhyips from Asset-Inv.com. 05.03.16 18:10	Account	Receive	+3.00	Received Payment 3.00 USD from account U11442845 to account U4731311. Batch: 131573375. Memo: API Payment. Withdraw to monitorinvestnet from Asset-Inv.com. 05.03.16 12:51	Account	Receive	+22.75	Received Payment 22.75 USD from account U11442845 to account U4731311. Batch: 131530175. Memo: API Payment. Withdraw to monitorinvestnet from Asset-Inv.com. 03.05.16 07:43;Account;Receive;Received Payment 18.5 USD from account U11442845 to account U1294989. Batch: 131490487. Memo: API Payment. Withdraw to allhyips from Asset-Inv.com. 02.05.16 11:27;Account;Receive;Received Payment 18.5 USD from account U11442845 to account U1294989. Batch: 131375591. Memo: API Payment. Withdraw to allhyips from Asset-Inv.com. 01.05.16 21:27;Account;Receive;Received Payment 20.00 USD from account U11442845 to account U1294989. Batch: 131316712. Memo: API Payment. Withdraw to allhyips from Asset-Inv.com.